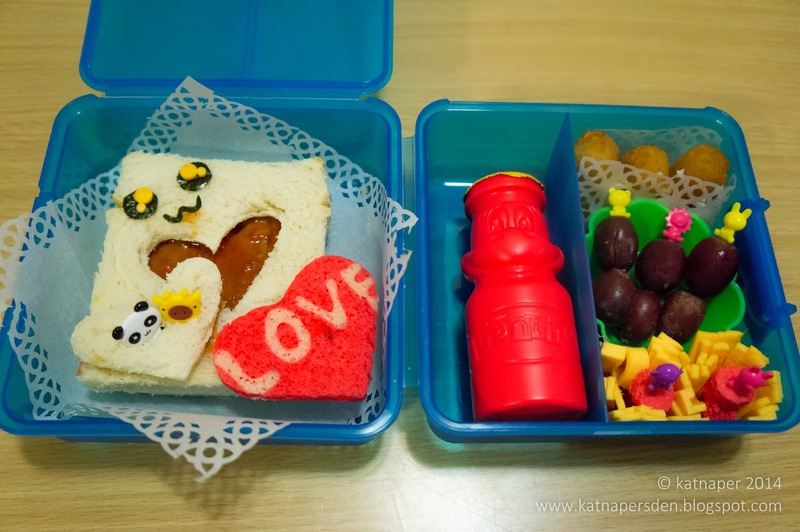 We're continuing with Bento Blog Network's Heart Theme this week so Kiddo's bento will feature hearts all week Speaking of hearts, she's been planning to make Valentine's Day cards for everyone in class and we have yet to decide if we are making cookies or pancakes. I vote pancakes but she's still undecided so we've left that off for now. To be honest, her Dad and I have been quite busy as Kiddo's baby sister hasn't been feeling well so both Hubs and I are exhausted. We did see the pediatrician today so hopefully with baby's new lotions and hypoallergenic milk my little Kidlet will do better. Fingers crossed its not reflux as she's been virtually throwing up her milk not just spitting it up. She seems to be doing better with her new formula Alimentum and not spitting up as much but I still have to keep her upright for 30 mins or so. Thank the LORD for the Mei Tai style carrier I made. Its been a great help keeping her upright and leaving my arms free to take care of big sis, Kiddo. But, yeah, I almost want to tell other moms out there to not wait 5+ years before having the next baby and not to wait till you're over 40. I just don't have the same energy as when I was 'younger'. LOL.